A post from Megan Enns, MCC Alberta Staff member who travelled with the Uprooted group. This guest blog is written by Megan Enns, peace and youth program coordinator for MCC Alberta. She recently led a young adult tour to the northern and southern borders of Mexico for the purpose of exploring themes of migration and peacebuilding. I grew up thinking the “American dream” was something of the past. It was an ideal from that age of “Leave it to Beaver” that, to most people now, seems unrealistic and even unappealing. While traveling with MCC on “Uprooted,” a migration themed young adult learning tour to Mexico, I was shocked to hear how very real that American dream is. Miguel and his son Jerry are in search of the American dream. 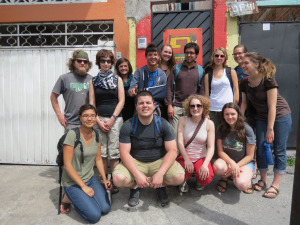 Our group met them in Mexico City at a shelter where they are staying, waiting, and planning to move north and to cross into America where they will hopefully attain that dream.